(Nanowerk Spotlight) Carbon fiber reinforced plastic (CFRP) composite materials, with their excellent strength and low specific weight properties, are suitable for all kinds of engineering applications and they have been increasingly replacing conventional materials. CFRP can be found in cars, trains, airplanes, sport equipment, windmill blades and in many other applications where 'lightweighting' is an important aspect of engineering. Of particular interest in this field are graphene-based composites. Research groups worldwide are working on the development of industrially manufacturable graphene sheets that have high strength and toughness in all sheet directions for diverse applications, from vehicles to optoelectronics and neural implants. "However, improvements in mechanical and electrical properties are needed before inexpensive graphene-based composites can be used for high-performance applications," Qunfeng Cheng, a professor at Beihang University in Beijing, tells Nanowerk. "Today, the common engineering solution is based on cross-plied carbon fibers in a polymer resin requiring high temperature cure. In contrast, we have demonstrated cross-linked graphene sheets that are manufacturable from graphene platelets, which are resin-free, processable at low temperature, and contain less than 10 wt.% additives." Cheng and his team, working with collaborators from the University of Texas at Dallas, led by Ray Baughman, reported their findings in PNAS ("Sequentially bridged graphene sheets with high strength, toughness, and electrical conductivity"). "The strengths of these graphene sheets in all in-plane directions match that of plied carbon fiber composites, and they can absorb much higher mechanical energy before failing than carbon fiber composites that are currently used in diverse commercial products," Cheng points out. "Today’s carbon fiber composites are expensive in part because the carbon fibers are produced at extremely high temperatures, which can exceed 2,500 degrees Celsius. In contrast, our process can use graphite that is cheaply dug from the ground and processed at temperatures below 45 degrees Celsius." 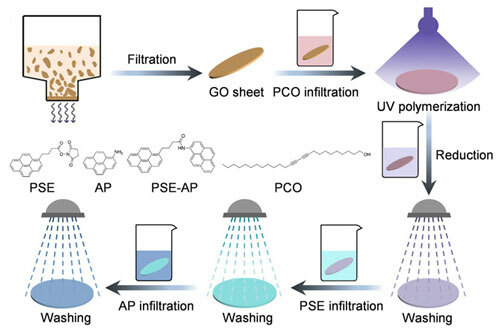 This advance provides a universal strategy for converting inexpensive graphene platelets into high performance polymer-free graphene sheets for the development of next-generation lightweight multifunctional materials. These graphene sheets could potentially replace the expensive CFRP fiber composites used in industrial engineering, as well as new applications in increasingly popular flexible electronics. Unlike the conventional approach for making graphene composites, where graphene platelets are uniformly layered in a host polymer, the researchers fabricated cross-linked graphene sheets from successive use of π-π and covalent cross-linking agents. The interplatelet bonding provides bridges between adjacent graphene layers so that no host polymer resin is needed, resulting in polymer-free nanocomposites. In their experiments, the team demonstrated simultaneous enhancement of tensile strength, durability, electrical conductivity and electromagnetic interference shielding efficiency, thereby opening the path to the design of layered nanocomposite materials using multiple types of quantitatively engineered chemical bonds between nanoscale building blocks. This approach eliminates the need for a polymer matrix. "We were intrigued by natural nacre, also known as mother-of-pearl, which gives some seashells their high fracture toughness," Cheng explains the inspiration for this work. "Nacre is composed of parallel platelets that are bound together by thin layers of organic material, similar to the way bricks in a wall are held together by mortar. Inspired by nacre, we have developed various interfacial bridging strategies for designing layered nanocomposites using multiple types of quantitatively engineered chemical bonds between nanoscale building blocks." He adds that graphene oxide platelets, having oxygen-containing groups and sp2 conjugated areas, provide abundant bonding sites for covalent and π-π bonding agents. Next steps for the team will be to develop high-performance graphene sheets using different cross-linking agents, which will meet the requirements for specific applications, such as structural and electronic applications. Another goal is to develop fabrication process for large-scale production for commercial applications. "Searching for manufacturable sheets having high strength and toughness in all sheet directions for diverse applications is a continuing challenge," concludes Cheng. "In addition, multifunctional nanocomposites that exhibit high electromagnetic interference shielding efficiency, smart separation, are mechanical-adaptive or self-healing, etc, will be in strong demand. Right now, the main challenge is to find a way to produce high-performance graphene nanocomposites on a large scale for commercial applications."